New prescriptions written per month for Victoza -- diabetes treatment sold by Novo Nordisk -- have leveled off just after Novo signed on celebrity chef Paula Deen as a spokesperson. Prescriptions for the drug were rising steadily for a year and a half prior to that. The two events may be coincidental (and the flattening may be temporary), but interesting nevertheless because it puts a hole in the theory that the return on celebrity endorsements of pharma products is worth the investment. The Victoza Rx data comes from a chart I found in the petition filed by Public Citizen with the FDA that asked the agency to withdraw Victoza because of increased risks that patients may developed pancreatitis, serious allergic reactions and kidney failure (find the petition here). It appears that the number of (new) prescriptions written per month has leveled off at about 150,000 -- a number that has not increased since about January 2012 when Novo announced that Deen would be a spokesperson (see "My Bad! Paula Dean Shills for Novo Nordisk, Not Novartis"). In its petition, Public Citizen states "As can be seen by subsequent FDA safety alerts issued for acute pancreatitis, thyroid toxicity, and kidney failure over liraglutide’s first year and a half of marketing, warnings have not succeeded in preventing serious adverse reactions. This is especially unfortunate because diabetics are already at increased risk for pancreatic and kidney toxicity. ... 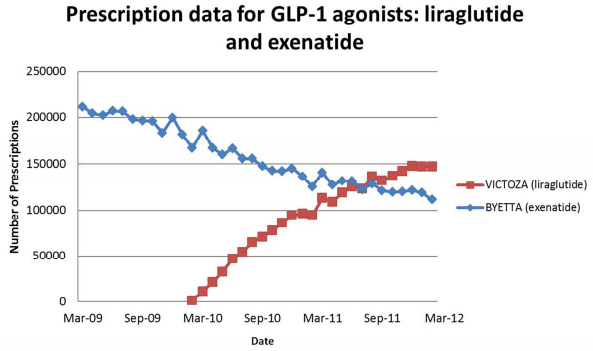 The number of prescriptions for liraglutide has been steadily rising, putting increasing numbers of patients at risk of adverse reactions to this drug. The increase in adverse reactions is seen in the continuing reports in the FDA’s database, making it clear that the FDA’s use of warnings is not sufficient protection." Public Citizen, however, does not report that based on post-marketing data, BYETTA has also been "associated with acute pancreatitis, including fatal and non-fatal hemorrhagic or necrotizing pancreatitis" according to the safety information that is part of its "package insert." Will this new focus on Victoza safety information scare Paula Deen? Can she discontinue taking Victoza if she felt it was necessary or would her contract with Novo prevent her from doing that (she does take other medications to control her diabetes)? I think it's a coincidence that the numbers fell and not a cause and effect due to Paula Deen. If you look at the Byetta numbers, the entire market is soft. If it were a blow back from the campaign,you would expect to see a lift with Byetta. Thanks for your observation. Of course, this doesn't prove anything. It is not possible to prove that Deen is having any impact on sales at all. Which leads me to ask, What parameters do marketers use to measure the ROI of celebrity endorsements? Maybe Ambre Morley can tell us how she measures the Deen ROI.